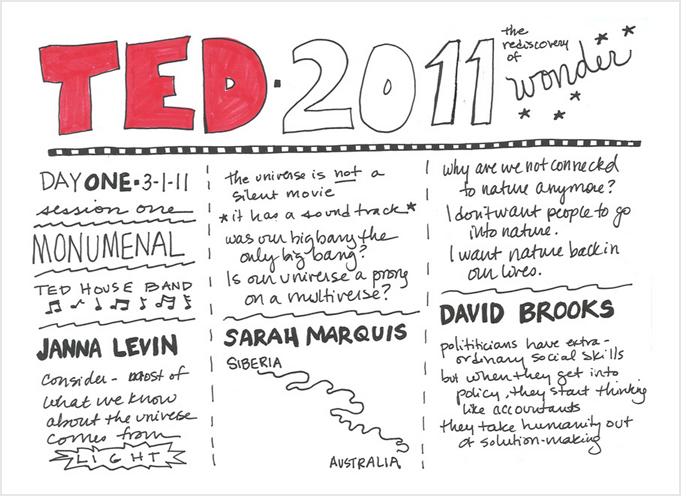 I've finished scanning and uploading my graphic notes from the 2011 TED conference. I take these notes so I can share the experience of being at TED with as many colleagues and friends as I can, and it's also a great way to retain more info; in fact, there was a TED talk this year by Sunni Brown about the benefits of doodling. Those who doodle can retain up to 30% more information. :) So enjoy, and feel free to annotate the images on Flickr with your thoughts, ideas, reactions. The full set is available on Flickr, or in the slide show below. TED 2011 sketch notes, a set on Flickr.